USPOULTRY and the USPOULTRY Foundation have recognized Mike Lilburn (pictured, left), professor in CFAES’s Department of Animal Sciences, as the 2016 recipient of the annual Charles Beard Research Excellence Award. USPOULTRY is the U.S. Poultry & Egg Association. 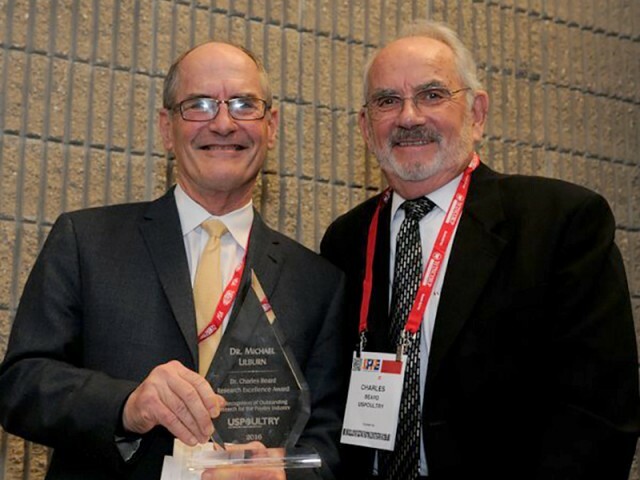 The award is named in honor of Charles Beard (pictured, right), former director of the Southeast Poultry Research Laboratory and former vice president of research at USPOULTRY. The USPOULTRY Foundation Research Advisory Committee selected Lilburn for the prestigious award based on his exceptional research to define the nutritional requirements and optimize growth performance in turkeys and chickens. During the course of his research, Lilburn has received research grants from USPOULTRY and the USPOULTRY Foundation to investigate the digestibility of amino acids in broilers and turkeys, the influence of age on the digestibility of amino acids in turkey poults, the available phosphorous requirement of broiler breeder pullets, and the optimal body weight growth curves for turkey breeder hens. Lilburn has an impressive record of communicating his research findings to the poultry industry and assisting in implementing innovations. “The U.S. Poultry & Egg Association has been very supportive of our research program over the years, and I am extremely grateful for this support. Dr. Beard’s research career is impressive, and I am pleased to receive this award which bears his name,” Lilburn said.